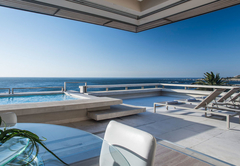 Blue Views Penthouse One is a property providing self catering in Bakoven for up to 4 guests visiting the Atlantic Seaboard region. 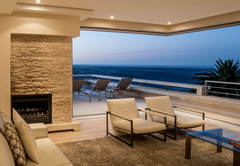 Blue Views Penthouse One is within walking distance of the Camps Bay beach and is just 4km from Llandudno. 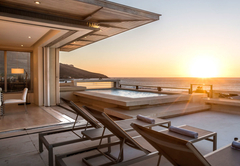 This is a unique location with unsurpassed sea and mountain views. 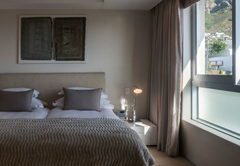 Blue Views Penthouse One is a contemporary styled penthouse apartment that can accommodate four guests on a self catering basis. 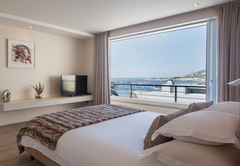 There are two bedrooms, both furnished with King-size or single beds. 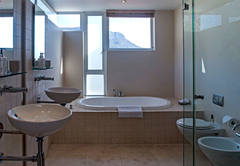 Both rooms have an en-suite bathroom. The apartment is fully air-conditioned and has an open plan lounge, dining and kitchen area. The kitchen is fully equipped for self catering and includes a washing machine, tumble dryer and dishwasher. There is a large entertainment area as well as a swimming pool. Braai facilities are provided. 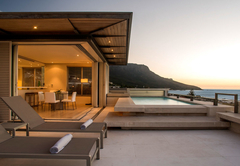 Apart from all the attractions offered by Cape Town City itself, the finest and most popular beaches are to be found along the Atlantic Seaboard. Response timeBlue Views Penthouse One typically responds to requests in 5-10 minutes. Child policyThe penthouse sleeps up to four adults and is not suitable for children.